UQ Masters swimmer, Brett Woods (Woodsy), approached me just over 2 months out from the Pan Pacific Masters Games. He had presented to me his goals – lofty goals – of winning all his events in his age group and breaking every Pan Pacific record. Woodsy is more than an accomplished swimmer, however he was setting himself a tall order in selecting events outside of his comfort zone of sprinting. I was… dubious to say the least. However Woodsy was determined, his training was impeccable and his preparation motivated me into believing that anything was possible. With each week and each improvement in the pool, I started to wonder how fast Brett could go. However two weeks out from the meet Brett was devastated by a family bereavement. As expected this had a big effect on Woodsy, especially his mental state. To compound matters he had been carrying an injury for a vast period of the training program, a partially torn tendon in his right shoulder. Although minor it was enough to notice ongoing pain after each session. The goal now as a coach was no longer about going to the Championships to break records, but to support Brett through a tough period, to assure him that he would be alright. Woodsy did compete at the Pan Pacs, injured and all. He had his wife and dad there to support him along with his UQ team mates. He won all of his events…. And broke every record along the way, no small feat. However it was his final swim, the 100m free that I think is one of the best races I have been a part of as a coach. 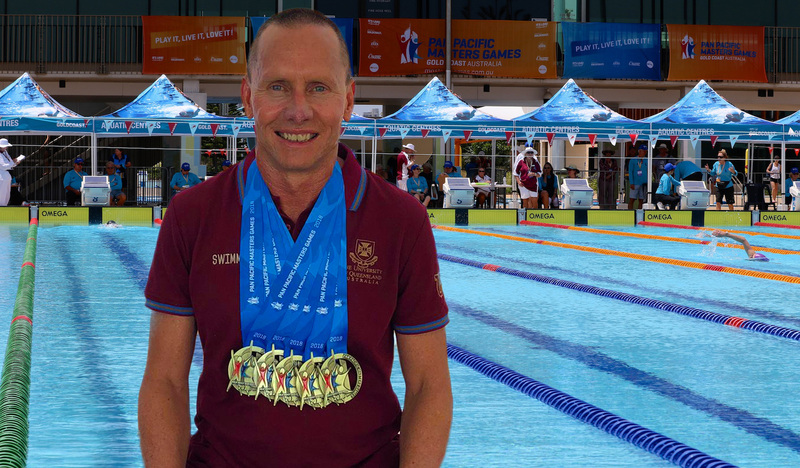 With the body sore and the mind spent at the end of a long month and long week of racing, Woodsy produced the fastest 100m freestyle he could… 56.99. A time that we had both laughed off early as a pipe dream. He showed that the measure of being a success is about being determined and courageous, to dream big and not give up. Woodsy broke the Pan Pacific record, Queensland State Record, Australian National record, and swam the fastest time in the world for his age that year. This swim is ranked as the 7th fastest of all time in the world for his age. It was an extremely proud moment for Brett and his family – both watching at the pool and those that couldn’t be there. 56.99 at 56 years of age.